With the exception of the Ten Thousand Islands/Everglades segment, this is the remotest segment of the Florida Circumnavigational Saltwater Paddling Trail, featuring long stretches of unspoiled shoreline, marsh expanses, and sea islands. The Big Bend also has the most stable population of bay scallops in the state and the most intact seagrass beds. These seagrass beds serve as vitally important nurseries for fish, shrimp, crabs and a host of other marine species, one reason the Big Bend Seagrasses Aquatic Preserve covers much of this segment. Spanning more than 945,000 acres, the aquatic preserve is the largest and possibly the most pristine in the state. Fortunately, much of the Big Bend coastline is in public ownership. 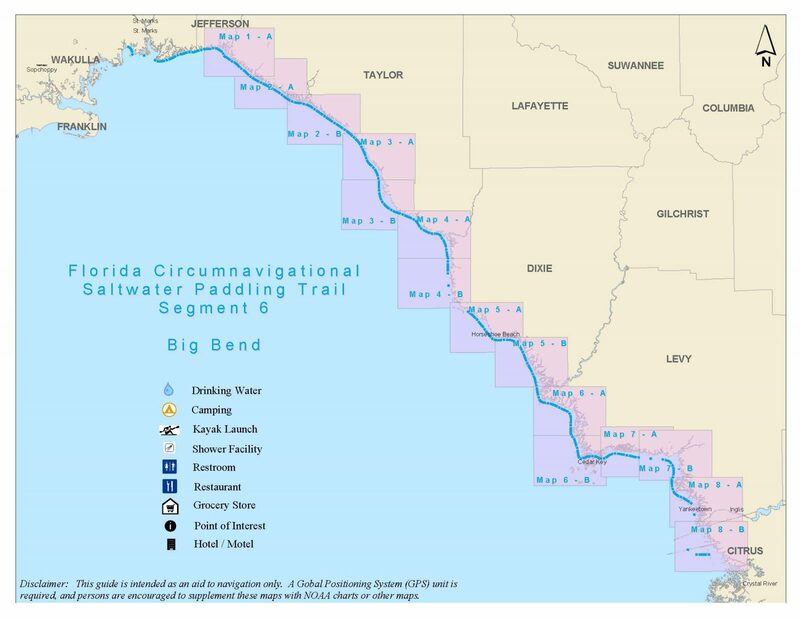 The first 105-mile stretch of the trail, including six primitive campsites, is managed by the Florida Fish and Wildlife Conservation Commission as part of the Big Bend Saltwater Paddling Trail. Free permits must be obtained before using any of the campsites and an online calendar makes checking availability and reservations simple. Campsites are marked by white poles and signs and limited to 8 persons and 4 backpacking size tents to better protect the fragile coastal environment, a general rule to follow along the entire segment. The six campsites are closed during the busy July and August scallop season. These are not the best months for overnight camping anyway with almost daily storms, biting insects and intense heat. The trail guide is recommended for paddlers in this section as it provides more detailed information and waterproof maps. To purchase the trail guide, click here. Near the Suwannee River, you’ll pass through lands managed by the Lower Suwannee National Wildlife Refuge. The refuge covers numerous islands and more than twenty miles of the famed river of song. A number of excellent paddling trails maps are available. Near Cedar Key, the Cedar Keys National Wildlife Refuge encompasses 13 historic and wildlife-rich islands ranging in size from 1 to 120 acres, totaling 762 acres, It is unlawful to camp on either the Lower Suwannee or Cedar Keys national wildlife refuges. Two state parks are part of this segment—Econfina River State Park and Waccasassa Bay Preserve State Park. Econfina River encompasses more than 3,000 acres of pine flatwoods, oak/palm hammocks, and broad expanses of marsh and tree islands. The 34,000-acre Waccasassa Bay Preserve State Park offers sweeping marsh vistas and tree islands between Cedar Key and Yankeetown. This is a remote area where cell phone coverage can be non-existent. Being properly equipped and prepared and leaving a float plan is very important. Also, you may travel two to four days at a time without being able to replenish fresh water supplies, and opportunities for replenishing food supplies are also scarce, so plan accordingly. The coast here can be very shallow and low tides can present a problem for navigation and when seeking to land or launch at campsites. Keep a tide chart to help plan your trip and count on tides making access a challenge. You may have to paddle a mile or two off the coast during extreme low tides. Click here for maps and trail guide. DISCLAIMER: The Original Florida Tourism Task Force (dba Visit Natural North Florida) and the North Central Florida Regional Planning Council do not warrant the accuracy or timeliness of this map and paddle guide or the safety of this trail for use by paddlers. Paddler should use this trail only if they have the adequate skill level and equipment, and paddlers must make that determination. Paddlers should also check weather forecasts and water levels in advance to avoid unnecessary danger. The Original Florida Tourism Task Force, the local governments in which these bicycle routes are located and the North Central Florida Regional Planning Council are not responsible for any damages whatsoever from its use. NOTE: The video below references the Big Bend Saltwater Paddling Trail. The video is equally applicable to Segment 6 of the Florida Circmumnavigational Paddling Trail as the Big Bend Trail covers virtually the same area.